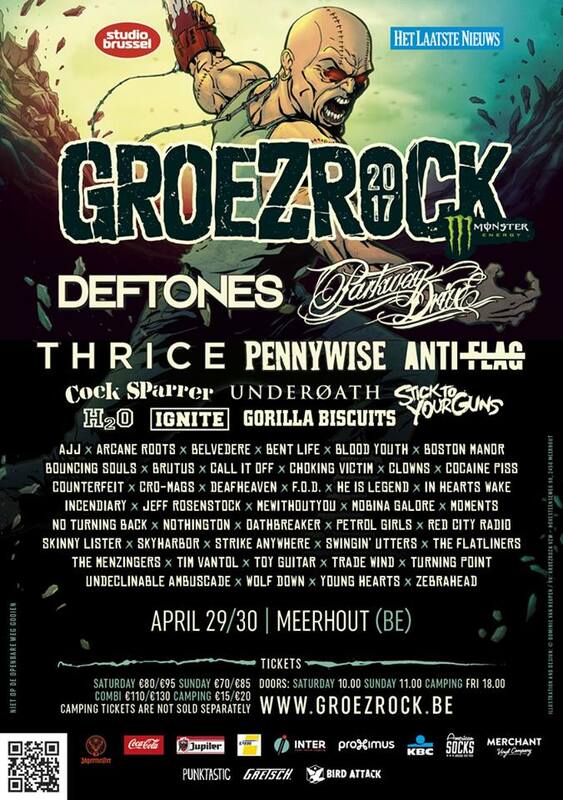 25 years of Groezrock: an anniversary edition with lots of great names, both big (Rancid, No Use For A Name, Sum 41) and small (Bad Cap Bad Cop, Muncie Girls) and somewhere in between. Somewhere in between is where you had to look to find the acoustic acts this year. While last year still incorporated some acoustic artists on the Macbeth Stage (Ducking Punches), this year Frank Turner was the only one on the big stage with an acoustic guitar with him. Still, in several places you could find some peace and quiet – *ahum* – with some acoustic music. Read our report here! Starting off on the day before Groezrock, the guys from North Empire Bookings organise the annual Acoustic Punk Meeting, always located near the barbecue area on the camp site. The concept: no amps or mics – real acoustic music. Everyone is welcome to play, and this has even resulted in Joey Cape, Will Wagner (Smith Street Band) and Russ Rankin playing the meeting. This year most people just played well-known covers, which ended with everybody singing along to songs by Frank Turner, NOFX, The Menzingers, Green Day, Rancid and many others. After a good night sleep the festival officially starts on Friday just before 4 pm and whilst everyone is still exploring the new layout of the festival, Frank Turner is the first to play the smallest stage on the whole of Groezrock: the American Socks stand. Even before he comes in, it is already clear the small merch tent has too little capacity for the number of people wanting to see the acoustic sessions here. Frank Turner always wants to give his fans something special, and for the set at the American Socks stand he does have something special planned: the beloved Englishman plays a couple of songs that will not make an appearance during his normal set later on the day. Without anyone realising it in the spur of the moment, Turner plays one song of each of his albums: ‘The Balled of Me and My Friends‘, ‘Love Ire & Song‘, ‘Dan’s Song‘, ‘Glory Hallelujah‘, ‘Tattoos‘ and ‘Love Forty Down‘ pass in random order. Right after Frank Turner, Less Than Jake is celebrating the release of their live album ‘Live from Astoria‘ by doing an acoustic set in the backstage area. Cool to see, but it is a shame not everyone can see it. Hopefully they will do this more often, so more people can enjoy them playing songs like ‘Look What Happened‘ acoustic. Back to the American Socks stand: Sum 41 backing guitarist Tom Thacker plays some songs from his other band GOB, together with Dave “Brown Sound” Baksh. They even have a sing along from the crowd, doing the backing vocals for ‘Banshee Song‘. Every other acoustic session is so heavily visited that you can hardly find a spot even close to the tent. There is an amazing turnout for Israeli band Not on Tour and Much the Same, who both have their normal set the day after. Not on Tour might just be the fastest band to perform acoustic this whole weekend. The refreshing sound of vocalist Sima Brami and the fast acoustic play by guitarist Mati make everyone sort of bang their heads to songs like ‘I Wanna Be Like You‘ and ‘Flip‘. The biggest turn-up for today is for the Mad Caddies though. The Californian ska/reggae punk band has a lot of fans at the festival, that you cannot even get close to the American Socks stand. For most people standing outside, that is no problem either way. They just ‘skank’ in front of the tent, whilst in the tent some even crowdsurf. On day two, the American Socks starts with a triple dose from the Netherlands, opening with Note to Amy. The heavy, clean vocals by Remco Tuns sound really good, but it is clear they are no standard punk rock band, as guitarist Eelco Overmeen bring some more heavy riffage. Next up is The Morning Hour. This band has already broken up, but is doing a one-time only acoustic show on Groezrock. The emo tracks are all well-received, which makes you wonder: why did this band ever quit? Call it Off – a force to be reckoned with – played the Macbeth stage last year, and is back this year for an acoustic session. It seems a lot of people remembered them, because the American Socks stand – even though improved a bit – is filled to max capacity once again. Everyone is singing along to songs like ‘Dyanne‘ and ‘Forward or Crazy’ and White Russian Records owner Roelof can even be seen crowdsurfing during one of the oh-so-catchy songs. One other band with oh-so-catchy pop punk songs is Four Year Strong. Starting off with asking if everyone in the tent wants to sit down, so everyone can see something, is taken to heart by everyone. Fittingly, they start with ‘On a Saturday‘. Dan O’Conner and Alan Day play with such ease, they clearly have done acoustic sets more often. They play a set full of crowd favourites like ‘Find My Way Back‘, ‘Stuck in the Middle‘ and ‘Maniac (R.O.D.)‘. So much for the peace and quiet, because everyone if singing and clapping along to everything. Not a lot of acoustic stuff this year, but for what it was, there has been a terrific turn out. Groezrock always does its best to please its visitors, so hopefully the acoustic will return next year just a little bit bigger again. This entry was posted on Tuesday, May 31st, 2016 at 12:37 PM	and tagged with Acoustic Punk Meeting, Alan Day, American Socks, Call it Off, Dan 'Oconner, Dave Baksh, Eelco Overmeen, Festival, Four Year Strong, Frank Turner, Groezrock, Less Than Jake, Mad Caddies, Mati, Much the Same, North Empire Bookings, Not On Tour, Note To Amy, Remco Tuns, Sima Brami, The Morning Hour, Tom Thacker, White Russian Records and posted in Live, Reviews. You can follow any responses to this entry through the RSS 2.0 feed.